OWINGS MILLS, Md. (AP) — Lamar Jackson isn’t staying awake at night thinking about the prospect of making his first NFL start. Baltimore Ravens starting quarterback Joe Flacco missed practice Wednesday because of a hip injury, and his status for Sunday’s game against the Cincinnati Bengals is uncertain. If Flacco can’t go, coach John Harbaugh likely will turn to Jackson, whose first pro season thus far has been spent taking a few snaps per game in run situations. Flacco hurt his hip early in a 23-16 loss to Pittsburgh on Nov. 4. He had the bye week to recover, but is still receiving treatment, meaning his availability for Baltimore (4-5) against the Bengals (5-4) could come down to a game-time decision. Harbaugh appears done talking about it. 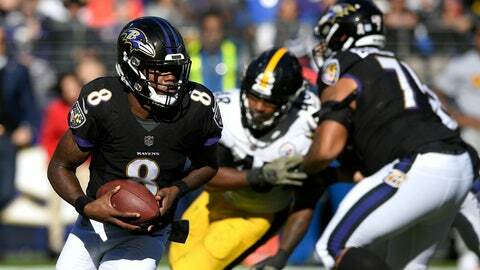 If Flacco can’t play, veteran Robert Griffin III will likely serve as backup to the rookie he’s been mentoring since summer. Griffin, like Jackson, was a running quarterback who had to make the transition into a passing league. Griffin won the Heisman Trophy as a junior at Baylor and finished with 2,254 yards rushing with 33 touchdowns. Jackson won the Heisman in 2016 and finished with 4,132 yards on the ground with 50 touchdowns. Now they’re together in Baltimore, trying to get the Ravens into the postseason. After sitting out last season, Griffin launched his comeback by signing in April with the Ravens, presumably to be Flacco’s backup. He dropped to No. 3 on the depth chart soon after Baltimore traded up to get Jackson in the first round. Though he has 41 career starts (including playoffs), Griffin will likely serve as a backup Sunday if Flacco can’t play. At least he will be in uniform after spending the first nine weeks on the inactive list. He will do what he’s asked on Sunday, but makes no secret of his desire to start. Griffin wants to win, and his main contribution toward that end has been to make the 21-year-old Jackson a better quarterback.